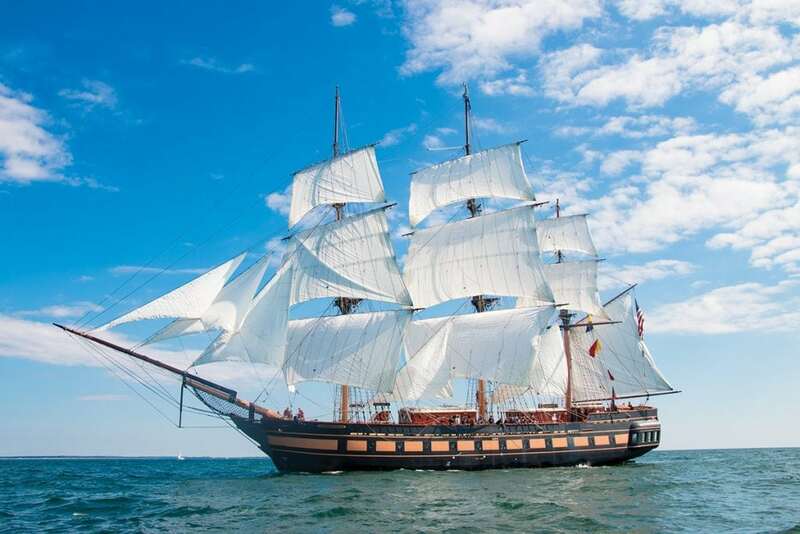 Big, beautiful and majestic, there’s far more to Tall Ships than meets the eye. I know exactly when I first fell in love with tall ships. It was 1976, and I was taking a break from my summer job as a clammer on Long Island, New York’s Great South Bay. With a bushel of little necks already racked, I was off to a great start that morning so I took an early lunch. Pulling up onto the shore of Fire Island, I cut through the dunes and sat down just beyond the reach of a gentle surf. That’s when I saw them: tiny dots growing steadily on the southern horizon. Within minutes, three tall ships were in full view, the lead volley for Operation Sail 1976, and celebration of the American Bicentennial. They were en route to New York Harbor for what was to be the largest assemblage of tall ships since the Battle of Navarino in 1827. In that Mediterranean encounter on the Ionian Sea, Allied forces from Britain, France and Russia defeated Ottoman and Egyptian forces trying to suppress the Greek war of independence. It was to be the last major naval battle fought entirely with sailing ships. I was mesmerized, having never seen such magnificence upon the water and having no idea about Operation Sail until seeing news clips of it on television the next evening. I watched the ships continue to head directly toward my position until about two miles off the beach, where they veered to port and paralleled the coast heading west. Sails fully expanded despite nothing more than a wisp of tailwind, I imagined them to be the Niña, Pinta and Santa Maria discovering the New World and marveled at their strength and steady progress even while wondering how they could have safely traversed such an enormous and treacherous expanse as the open Atlantic. Obviously, the place of these majestic vessels from a historical perspective is hard to deny. Over the centuries they have been used for exploration, exploitation, trade, war, and transportation. For more than 400 years they expanded the world through transoceanic voyages, served as an expression of military might and colonial aggression, ferried supplies, transported slaves, and sheltered pirates. The tall ships were modified in shape and form as craftsmen, architects and artisans stretched their knowledge of navigation, engineering, woodworking, and other technical crafts in a never-ending quest to go faster, build bigger and push further. As the world gravitated from wind- to steam- and gas-powered vessels for even more speed, range and carrying capacity, many tall ships were recycled as fishing boats, especially in the waters off Alaska where they hauled salmon by millions of pounds per year. Today, they serve not only as a reminder of a proud and sometimes checkered past but as relevant, modern-day mechanisms for learning and growing on a personal level. For students, explains Wurzbacher, the educational aspects are especially attractive. Sailing on a tall ship affords unique ways to learn outside of traditional classroom settings and is far more hands-on. Still, it’s the sense of community that is often most rewarding on these voyages. lines, fairly low freeboard and raked-back masts, she has sailed from the Canadian Maritime to Cuba, through the Panama Canal, on the Great Lakes, to Ha and spent 9 years on an education mission along the West Coast—all this in just 16 short years. With square sails, she is more strenuous to maneuver than a simple schooner, but the challenge of keeping her on point and at speed adds extra sweetness to each passage. Of course, if you just want to get a little closer to a tall ship or perhaps enjoy a simple tour, catch them at a variety of tall ship events, seafaring festivals and maritime gatherings held at deep-water seaports along the coast. To crew, you’ll need to dig a little deeper and contact the ship’s operations station. 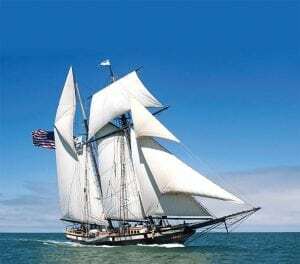 Check below for specific information regarding 2018 tall ship events, the Tall Ship Challenge, and sailing schedules/tours/services for individual vessels. If you want to take a deck tour, enjoy a cruise or even crew aboard a tall ship, there’s a good chance one will be visiting a deep-water port in your area. Seafaring festivals are a logical place to track down these vessels, and an Internet search will easily put the information at your fingertips. Licenses or special coursework are not required to volunteer on Tall Ships. Additionally, many tall ships have education outreach programs and set up private charters for corporate or organization excursions. 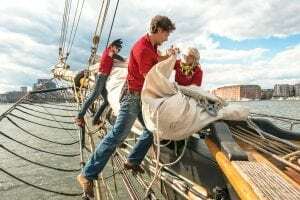 Those who sign up to crew can expect to mentor students in the realities of life aboard a tall ship: setting and striking sails, maintaining the vessel, standing watch, navigating, performing safety drills, etc.